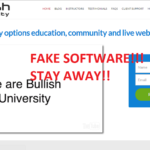 Prove My Profits Review - Confirmed Scam Software! Stay Away! 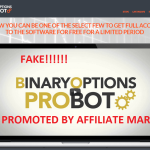 The Binary Options auto trading universe is brimming with new software. Brand new software with some novelty or the other come out almost daily. Each software is unique in the sense that its creators leave no scope for letting their visitors slip away unregistered. Today, we have a brand new trading software – The Prove my Profits System. Prove My Profits – What is it all about ? Admittedly Prove My Profits is a system which makes money making through Binary Options Trading a child’s play. Being fully automatic in every aspect, its arguably the easiest option available out there to make some serious money. A person named Ted Morgan introduces this new software to us in the promotional video. He is not the actual creator of the software, but a partner of an anonymous Mr. X. Mr. X is the real person in-charge of the software. Morgan explains that Mr. X fears of being harrased owing to his huge fortune and thus wishes to maintain privacy. This seems a little awkward since there is no shortage of wealthy people in this world. Yet, no one hides behind the curtains like Mr.X is doing. They shell out unbelievable figures of profits generated with the help of this app. People go to any lenghts to prove their point. Here too, Ted goes for a lie detector test facilitated by an ‘army ex-general’ Jonas Kane. So what did he say which required a polygraph test to believe? Ted states that the Prove Profits auto trading bot software has not lost a single trade thus far. He affirms that anyone with little or no knowledge of handling a computer or even no know-how of binary optiona trading are welcome. Even newcomers can rake in profits as high as $7000 per week. The told estimated minimum figure for a week is $50,000. Ted brags and says that the Prove my Profits system has made a whopping $5 Million for him. This he tries to validate by undergoing a polygraph test. Morgan claims that the trading system can easily make $498,561/month. And the flash point here is that you get to own the software for free? Also check my Swarm Tech review. Ted speaks of just 50 spots available for Beta-testing. The usual ask to hurry up else the spots will fill-up is present here too. The beta-testers of Prove My Profits scam are also personally assured of making great profits for themselves. The testers would be required to gather software data. The public release would happen sometime in 2017. As we always do, here we are with the verdict. 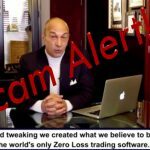 The Prove My Profits software is also a scam. You know how we felt suspicious? The polygraph test drama did them in. We remembered to have seen the same gimmick in a few older scams too. So, we did some investigation only to find out that our doubt was justified. 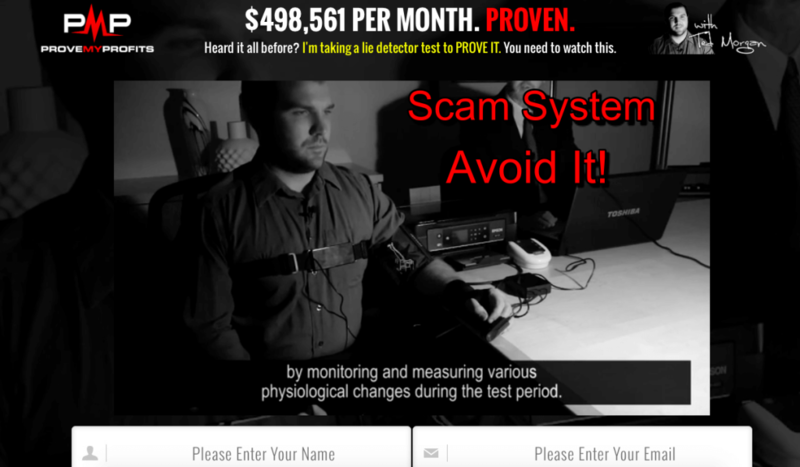 Prove My Profits is just another copy of ‘Lie Detector Millionaire’ and the ‘Polygraph Millionaire‘ scams. We could not get hold of the credentials of Mr. Morgan anywhere. Most probably he is also fictitious figure with no whereabouts. In the most likelihood, he is also a paid actor who would stuff his mouth with the words spponed to him by his masters. We all are already unaware of who thia so called Mr.X is too. One who fears legal backlash for stashing money (its a different story whether someone really exists or not) cannot be an honest and trustworthy figure. Would you invest your money trusting the words of such people whom you know nothing about. No whereabouts, no public profiles or social standing to vouch for them and they are millionaires! What more proofs can someone sought to prove this point? We have insider information that all this software does is hand over your investments to fraud brokers who are unregistered. These brokers then knowingly invest your money in losing trades and you cannot do anything about it. Just sit and watch all your money going down the drain. This earns the PMP guys affiliate commission and this is what they really are concerned about. Just anyone can be a Beta-tester? Another point we’d like to bring to your notice is regarding the beta tester spots. They say they want the testers to hand over the data of usage. How can just anyone irrespective of his profile,mental ability or educational and technical skills be roped in for the job? After all any level of data collection and statistical analysis needs a certain background and knowledge.You cannot just take anyone in your beta-testing work and start using their results. 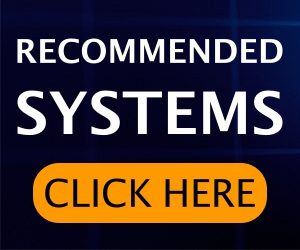 Moreover, any Binary options trading software, no matter manual or auto-pilot, can make you a millionaire. Not in a week, not in a month or even years! A flawless success rate is yet another bait you must not fall for. It all depends on so many contributing factors that to believe it as a general rule of thumb is plain suicide. We’ve highlighted a number of times that any out of the world promises and too good to be true advertorials should be scrutinized fully. Verdict – Prove My Profits Is Not Safe! Instead Join SnapCash Binary App With Proven Results! Thanks for reading my Prove My Profits review. Hope you are satisfied with our results and your queries have been put to rest too. In as much as we wish you earn money, we think its our duty to not ler you lose what is in your possession. Always inquire and search thoroughly any money-making scheme which show you the way to the ‘rich way of life ‘. 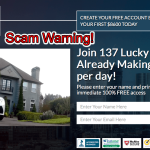 Lazy Millionaire Review – Confirmed Scam ; Don’t Waste Money!! Hi Sofy are there any Binary Robots that are Legit that don’t scam you could you please advise me.